It has been almost 30 years since the last Mad Max movie. Since then Director George Miller has done a variety of children’s films, in some form or another involving talking animals. At last, Miller has returned to the wasteland – but after a decade of Happy Feet and cutesy pigs, is he able to return to the world of fire and blood? Tl;Dr version – Yes he can, and it is a lovely day. Rated R by the MPAA. 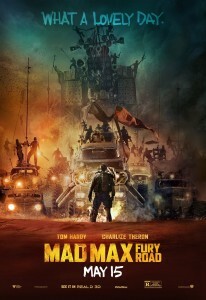 But more seriously: Max Rockatansky is captured by the forces of Immortan Joe, where he is kept alive due to having Type O Blood (the universal donor blood type) – to serve as a “Blood Bag” for Joe’s Warboys – cancerous young men promised immortal life in death if they will serve Joe in battle. When Imperator Furiosa steals one of Joe’s War-rigs, and flees into the desert with Joe’s “Brides” (women kept as slaves in order to bear Joe’s children) – Joe and all of his warriors, as well as the warriors of Gastown and the Bullet Farm – set out in pursuit. Max manages to link up with Furiosa, to help them escape across the desert. This movie just goes. The whole film is just one solid Road War. It’s not like The Road Warrior (or, for that matter Beyond Thunderdome), where the Road War is saved for the film’s third act. Instead the movie is effectively one solid chase, with occasional lulls here in the fighting here and there. In spite of all this, the film never loses a sense of geography. We generally know where things are in relation to each other. The world also has an interesting progression of the societal development we saw in Beyond Thunderdome. In the first three films, we went from “On the cusp of/during the fall” in the first film – where there were the structures of modern society left, but they were shaky and falling. In the second film, society had mostly fallen to banditry, with groups like Drill Town trying (and sort of failing) to survive against predation. In the third film, society had re-developed enough that the idea of a neutral trading post (Bartertown) was one that society had come to the conclusion that they needed and would support. Here, we have three settlements: The Citadel (lead by Immortan Joe), which supplies water; the Bullet Farm (lead by the Bullet Farmer), which is self-explanatory in what it supplies; and Gastown (lead by The People Eater), which again is self-explanatory. George Miller also still has it when it comes to shooting these Road Wars – all the quick (but coherent) cuts from the earlier films, brutal collisions and wrecks, are all here. All the car wrecks are practical (to the point that there’s reasonable chunk of the credits set aside for the dummy technicians who set up the dummies for those wrecks) – and the CGI is primarily done for shots that couldn’t practically be done (like the massive sandstorm seen in the trailers, and a few shots of actors being consumed by flame inside cars). Also, special note needs to be given to the Doof Warrior. He has no lines, and spends the entire film on his vehicle, with an apparent front end made of a platform in front of a slew of amps and speakers, with a quartet of drummers behind him. He just stands there as the War Party rides into battle, playing guitar riffs and shooting flame out of his guitar. Also, his guitar is a flamethrower. This is, quite possibly, the most Metal thing ever. This is, a weirdly darker film than Mad Max or The Road Warrior – there are signs that the world is far worse off than it was in those films. The particular example of note is the Vuvalini discussing their 160-day drive across the “Great Salt”. At a rough estimate, the only possible salt-flat that would require 160 days to drive across would be what was left if the Pacific Ocean had dried up. At which point, if the Pacific Ocean had dried up entirely, the world’s ecosystem is officially FUBAR – and Earth will likely become a lifeless, dusty ball within a few generations. Apparently Charlize Theron has lost her South African accent, because she’s using a straight American accent here, where everyone else is either using a British (Tom Hardy), or Australian (pretty much everyone else) accent. This film is currently out in a 3D and conventional 2D release. I saw this film in 3D. There’s a good combination of use of depth of field in some of the quiet scenes, and stuff flying towards the camera during the action scenes. You could make a good case that the film’s crashes, collisions, and people-getting-run-over-by-cars feel more visceral because they’re in 3D. In total, Mad Max: Fury Road, gets 35 out of 42.